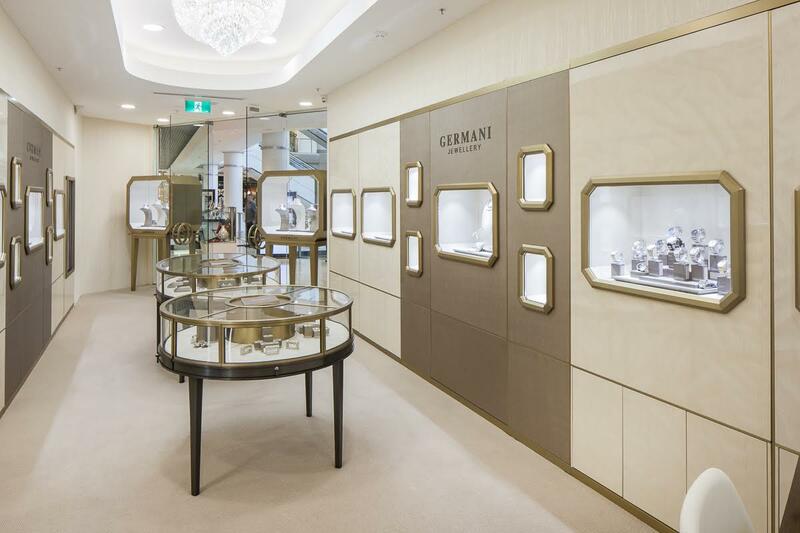 GERMANI’s flagship jewellery boutique, the new George Street luxury emporium in the heart of Sydney, reflects everything one expects from a high end brand name which holds an international reputation for creative Jewellery designs with diamonds and natural colourstones. The prominent boutique houses a unique display of exquisite precious stones and sculptured adornments – the pinnacle of luxury and rarity. Master Jeweller Michel Germani is renowned for respecting and accentuating the essential nature and attributes of each precious stone. Located in the main facade of the recently renovated Hilton Hotel facing the QVB, GERMANI’s exquisite interior harmonizes with the Hotel’s architectural image. This House’s distinctive design philosophy is the pursuit of the “exceptional” – combining innovative contemporary designs with unparalleled craftsmanship. 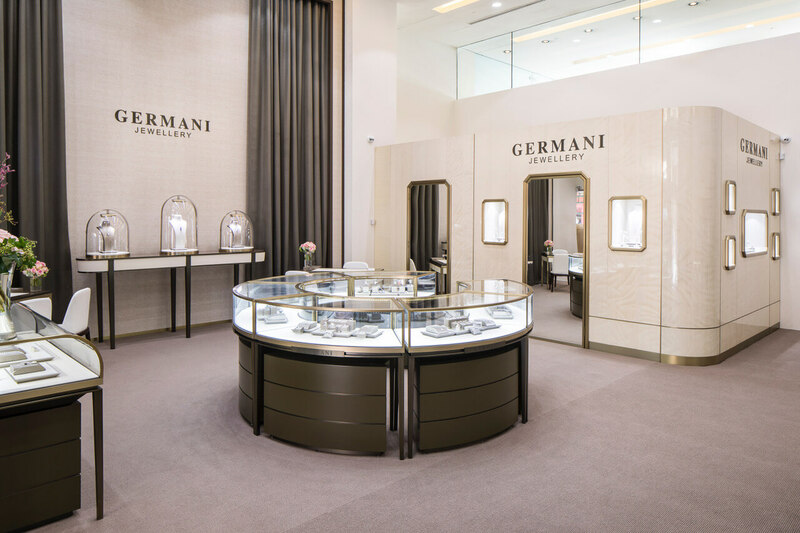 GERMANI’s familiarity with the code of the luxury world and its values and visions are reflected in sensitivity to space, light, surface and detail – both in Jewellery creations and retail premises. The prestige of this luxury emporium is encapsulated in the two storey’s high glass cube, the vast elevated transparent facades facing both the QVB and the Hilton lobby, unusual circular glass display cabinets and crystal bell domes, contemporary decor, majestic curtains and most importantly, superb lighting. Vast ceilings planes converge on the voluminous central display area and the more intimate desk seating and office. The extensive transparent facades and mirrored doors effectively create an airy light-bathed space, a feeling of openness and a sense of pleasure. 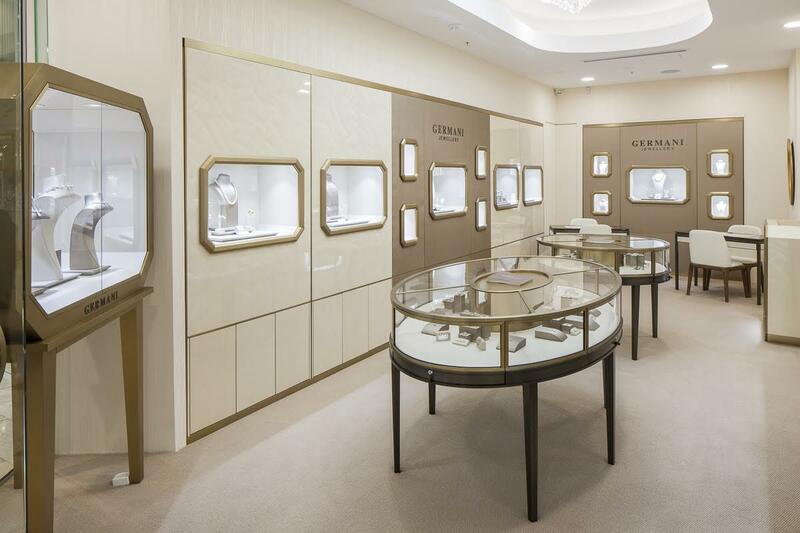 This new boutique highlights GERMANI’s distinct refinement by combining elements of elegance and luxury in an apparently simple yet opulent environment. Access is through both George Street and the Hilton lobby allowing visitors from all directions to effortlessly discovering the timeless gems within. This venue represents a convergence of progressive design, art, commerce and exclusive hospitality – a virtual laboratory of innovation and artistry. GERMANI’s commitment to the “exceptional” extends to its staff – for outstanding helpful advice and consultancy services. The discerning clientele is assured of a memorable retail experience. 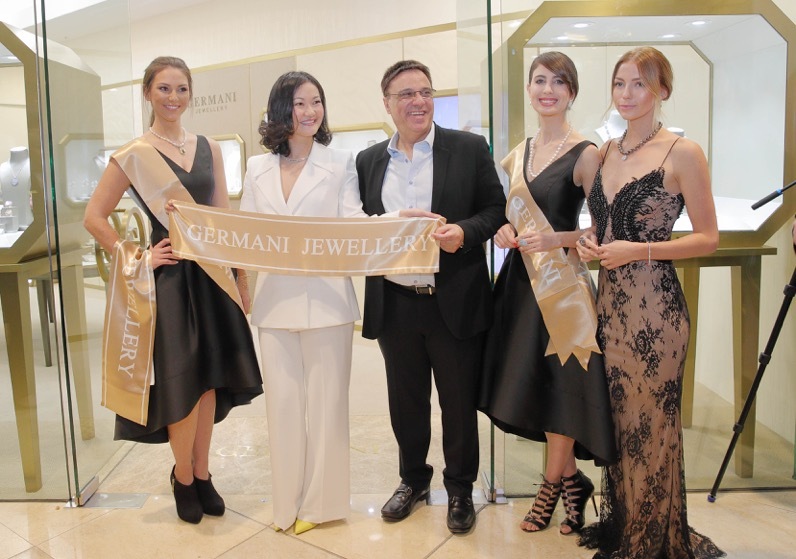 11 August 2016 saw a spectacular night for GERMANI JEWELLERY as it held the Grand Opening of their new Jewellery Boutique in Chatswood Chase. The event was exactly as you would have expected from a quality jewellery boutique, with exquisite champagne flowing, gourmet food and networking. 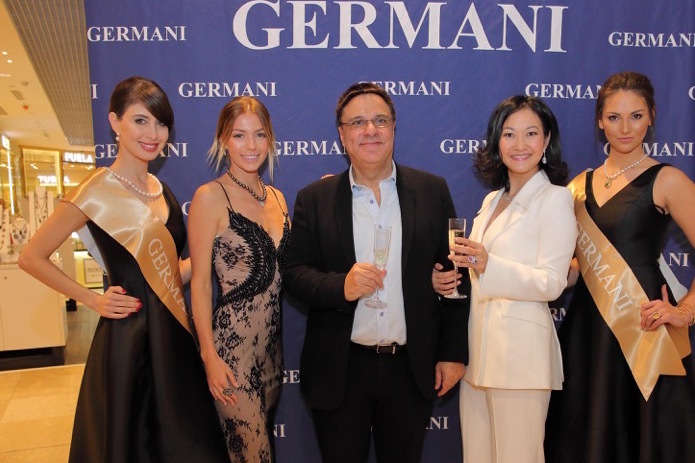 Distinguished guests and friends were captivated by GERMANI’s Exclusive Jewellery and Swiss-made Watches worn by models and VIPs. 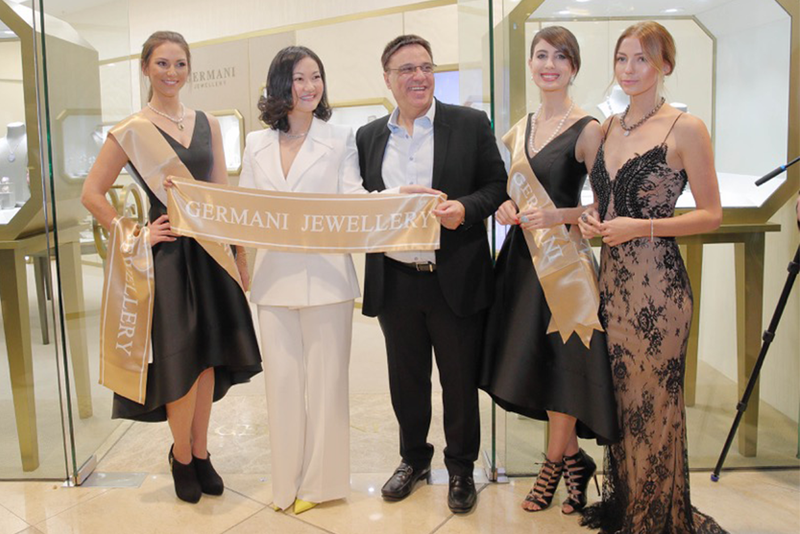 Launched in Australia in 1985 the GERMANI brand has now expanded by opening a new Boutique in Chatswood Chase where Michel Germani, founder of GERMANI JEWELLERY, intends to dazzle new and old customers with his breathtaking line of Fine Jewellery. 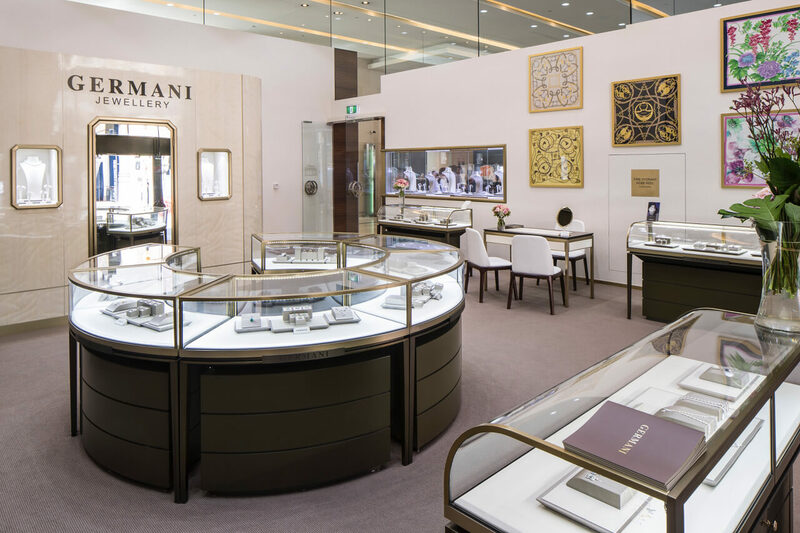 This Exquisite Jewellery Boutique is located on the ground floor of Chatswood Chase where exquisite pieces of Fine Jewellery and GERMANI brand watches can be viewed, admired and purchased at very competitive prices. All Germani pieces are marked by Elegance, Beauty and Individuality as Germani specialises in custom designs and remodelling. 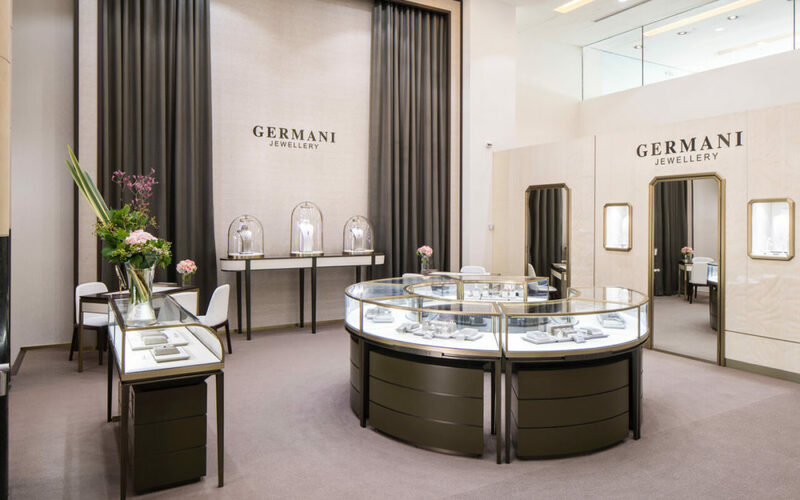 Be awed by GERMANI’s wide collection of Timeless Classical and Modern Designer Jewellery, the GERMANI Team are looking forward to see you soon! 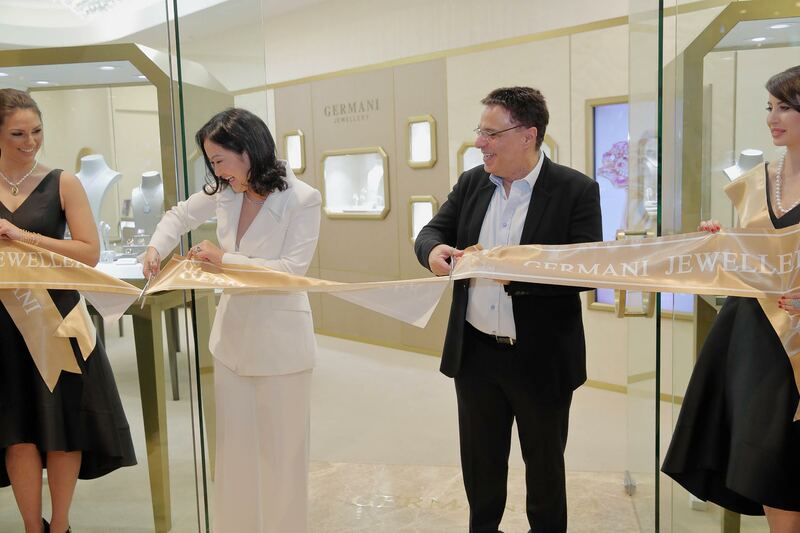 Launched in 1985 in Australia, Germani Jewellery after being in Sydney CBD for more than thirty years, now decided to open its first branch in the suburbs. Starting its expansion with a store in Chatswood chase. Germani caters for all budgets, using different materials and stones to suit all styles and tastes without compromising on quality. With European-made jewellery evoking a feeling of luxury without the hefty price tag. 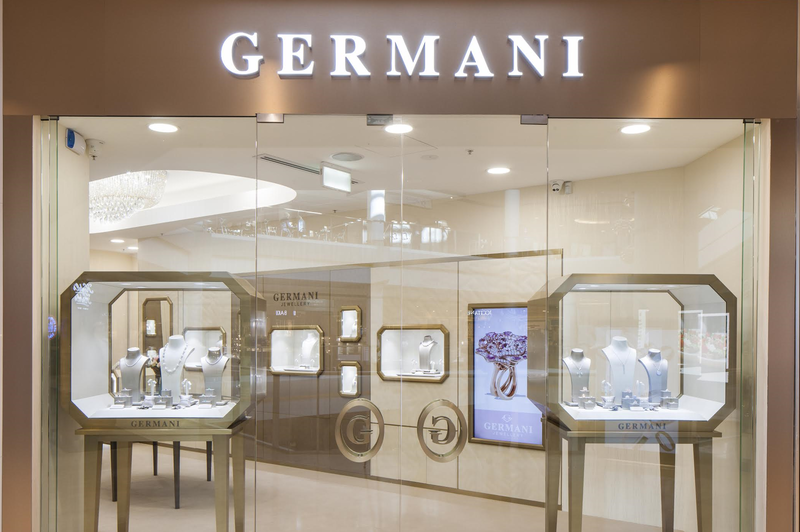 Germani is further expanding within the Sydney area with a new flagship store opening in Hilton hotel on 488 George St, across from Queen Victoria Building. 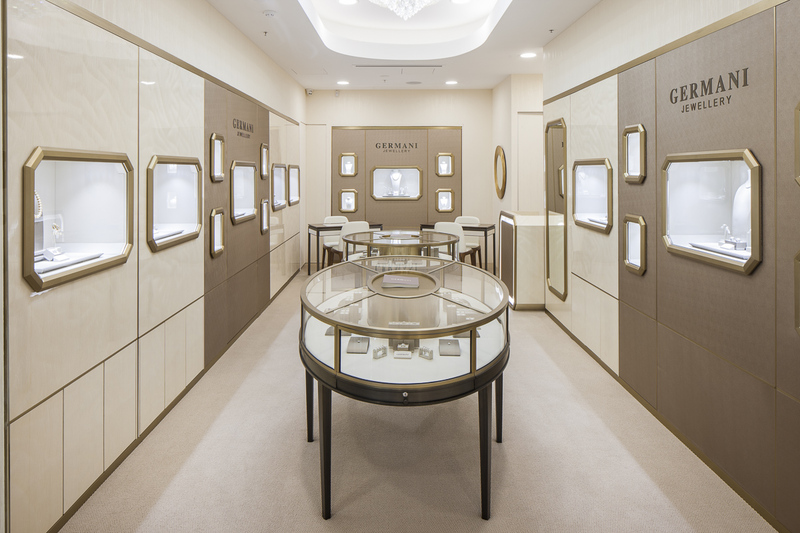 With the headquarters based in Sheraton on the park hotel, Germani is looking to launch its latest collection in Chatswood Chase while particular emphasis on high end fine jewellery at the exclusive Hilton branch. Both branches would stock Germani branded watches, Swiss-made, with ETA movement, water resistance and reliable. Some with an added touch of diamonds to suit your taste. Expect high quality fine jewellery, with a particular emphasis placed on finding the right gem quality stone. Expect classic designs, timeless jewellery, and personalised service. 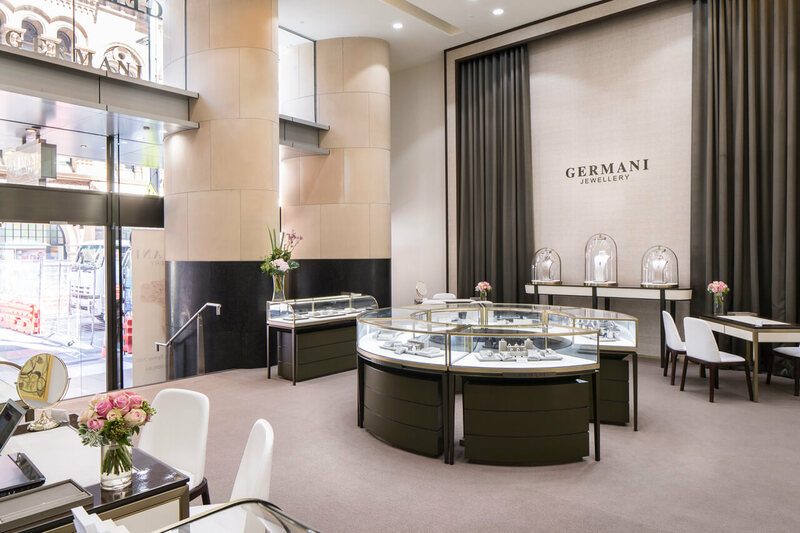 Whether you are looking for a present, pampering yourself or buying an investment piece, Germani Jewellery can deliver. 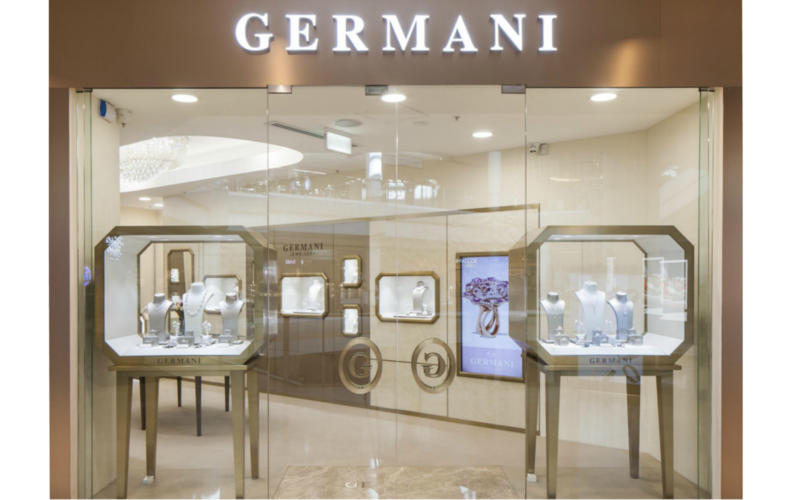 Housing an eclectic stock of both high end jewellery and affordable pieces, the stores aims to cater to personal tastes and expand the current Germani client base.